If you’re considering which materials to use for a new patio on your Chesapeake property, many landscaping experts recommend building paver patios. Pavers are usually made from concrete, natural stone, or clay, and they can be purchased in a variety of textures, patterns, and colors. Durability & Longevity – Because pavers are installed to form a flexible pavement system, they aren’t prone to cracking, and they’re usually 3 to 4 times stronger than a slab of concrete. Pavers are available in many colors, and these colors mask any chips or cracks that may occur over time, prolonging the pavers’ pristine appearance. Minimal Maintenance – If you want a patio that requires little maintenance, a paver patio is a great option. You won’t have to seal or stain repeatedly, and repairs are straightforward. Your paver patio can be cleaned easily by blowing or sweeping debris off the surface occasionally and by removing stains with soap and water. Your landscaping contractor can also apply a protective sealer to the pavers to increase their longevity. Weather Resistance – If you’re worried about how temperature fluctuations throughout the seasons will affect your patio, you can rest easy knowing that paver patios respond well to changing weather and temperatures. As the ground contracts and expands with outdoor temperature changes, your paver patio will resist cracking as a result of its flexible structure. Ensure Proper Drainage – Homeowners must ensure that their paver patio has proper drainage so that rainwater doesn’t collect under patios and near the foundations of homes. If a patio lacks sufficient drainage, water will accumulate beneath it, causing the pavers to sink or crack. Generally, patios are graded or sloped away from homes with an inch decrease in elevation for every two feet of length. Prevent Weed Growth – Your landscaping expert will likely place a special cloth, called a geotextile fabric, between the soil and sand beneath the pavers. This cloth will limit weed growth between the joints of the pavers. Polymeric sand is also placed between joints as additional protection against weed growth. Polymeric sand has fine grains that contain silica, which form a binding agent when mixed with water. Store Extra Pavers – After the construction of your paver patio, make sure that you keep a few extra pavers on hand for potential repairs in the future. If a paver becomes chipped or cracked extensively, you can replace it with one of these spare pavers. If you think that your Chesapeake home and household would benefit from a paver patio, contact Winesett Nursery and Landscaping, an experienced landscaping company. You’ll be able to collaborate with skilled landscapers to design a paver patio that complements and enhances your home. 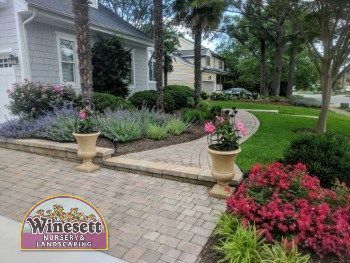 If you want to schedule a paver patio installation in the Virginia Beach and Chesapeake areas, please call Winesett Nursery and Landscaping at 757-426-7880 or complete our online request form.